So today started out with a nice adventure with Racquel from Perennial Gardener. After finding out that Les was not at work today we quickly regrouped and decided on going to Brent and Becky's in Gloucester, Virginia. As we drove up, the sign said closed. OH MAN!! I thought we missed out here too. Have no fear, we were early, they were just opening. We explored the grounds, the shop, the greenhouse and their planting beds....lots of interesting plant material. 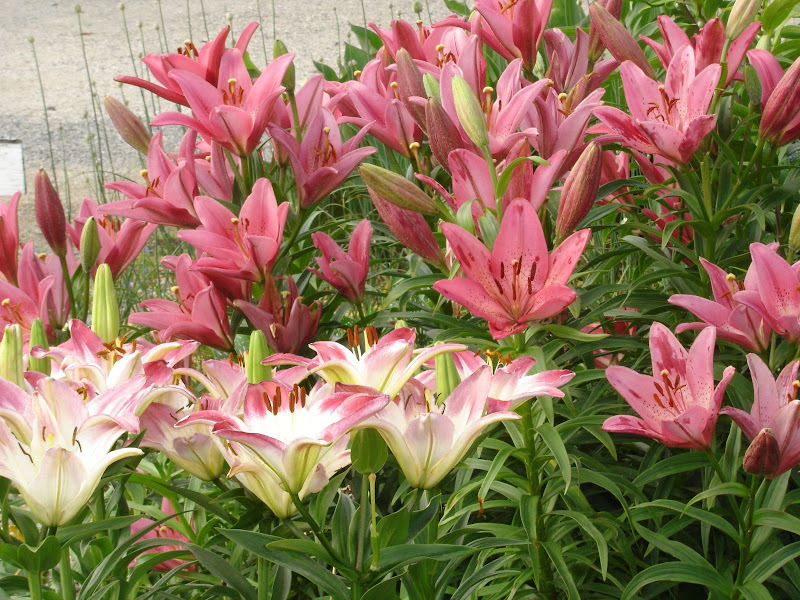 The lilies were just gorgeous. 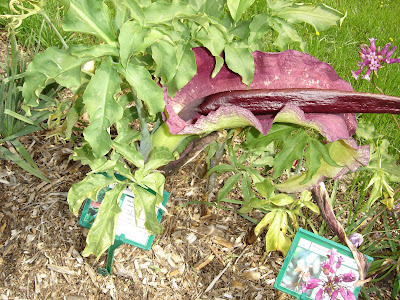 Perhaps the most bizarre flower is the Dracunculus vulgaris. 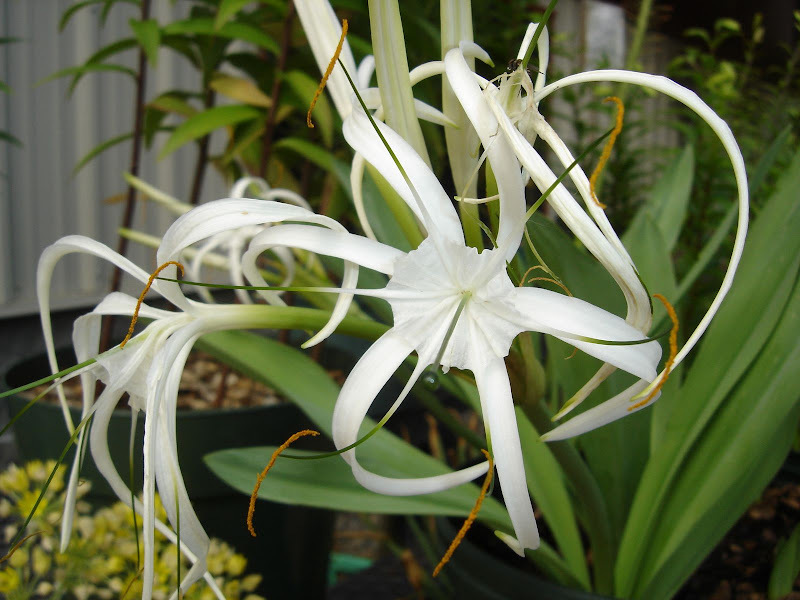 If you need a focal plant, this could the one for you. Here is a beauty, almost looks like the inside of the petals are peacock feathers. 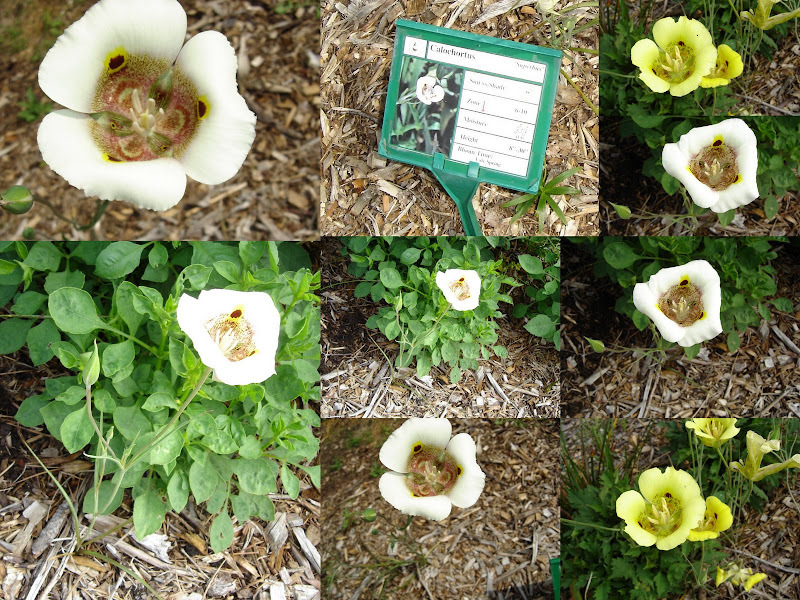 Click on the photo and you can read the plant label- Calochortus. 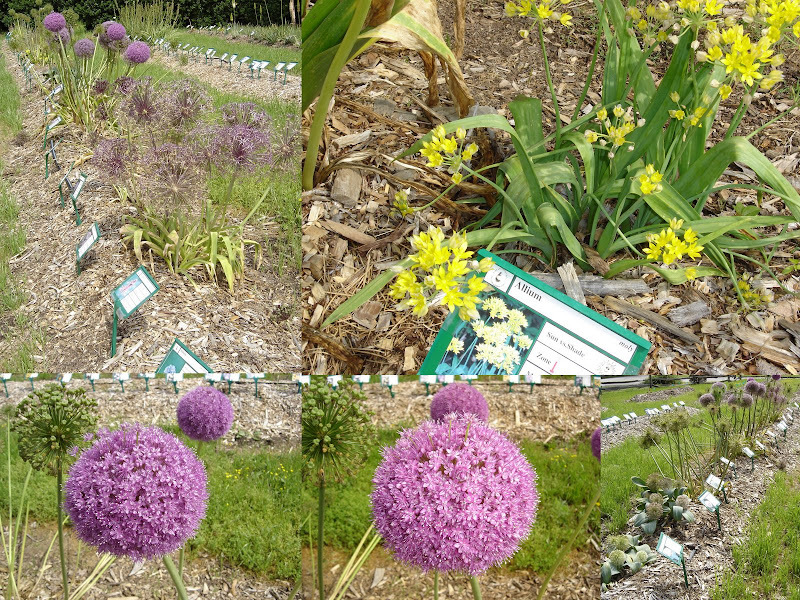 I am a fan of Alliums, there were plenty to see today! After some purchases we went out to the parking lot and my car didn't start. Yes, this is the same car that didn't start back on May 15th. Since we got home on the 15th it has been fine---until today. A kind young man who works at Brent and Becky's jumped the car and we were on our way. Pressing my luck, we stopped at another nursery on our way home. Racquel got some more plants and I found some sweet potatoes and beets at their produce stand. And guess what happened next??? Right! A nice young man jumped the car and we were on our way. We live across the York River from our shopping mecca. The Coleman Bridge is a swing bridge to allow ship traffic to and from Yorktown. Again, as luck would have it.....it was open!! I worried about the car stalling as we waited. We did make it home and we off loaded plants while I left the car running and we parted ways, promising to make another road trip soon. My car is up at the shop and it isn't the battery, it is the alternator. Here are my goodies from today. 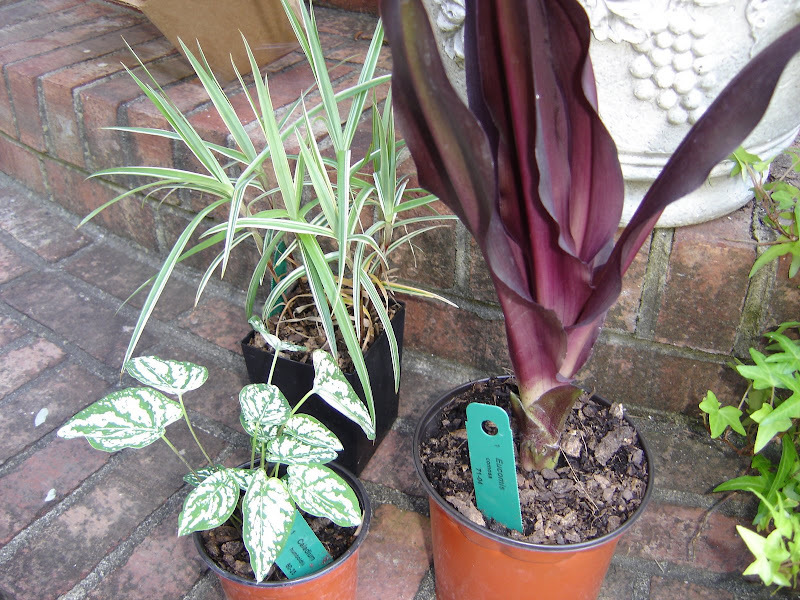 A tiny caladium, Eucomis - Sparkling Burgundy, and a replacement for my dead Carex phyllocephala 'Sparkler'. Now to figure out where to put them. Good dilemma! The last day of the trip was along the eastern shore, on the Delmarva peninsula. If you live along the east coast and have occasion to drive north or south --take Route 13 for a lovely, peaceful drive. We stayed in a Hampton Inn Wednesday night, nice hotel in its own right, but compared to the dorm........well, let's just say I felt like I was in the lap of luxury!! Our stop on Thursday was the Adkins Arboretum. This is a 400 acre native garden and preserve. 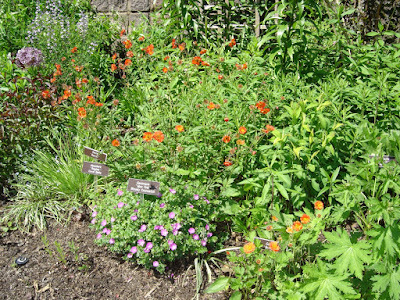 There is always discussion about native plants-- do you mean ones that came over with the colonists? 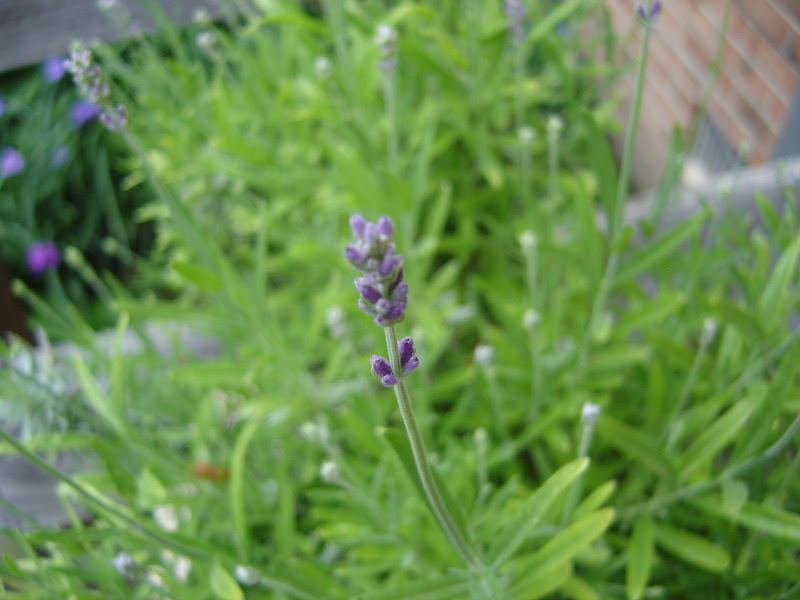 Do you mean plants that naturalize well in the landscape? What about those plants that were brought over mid-1800's? At the Adkins Arboretum our docent said their interpretation was if the plant was here at the time of colonial settlement..not brought over from the 'Old Country'. As the group was large we divided into two smaller groups. Each group was lead by a docent from the Arboretum and in one group our extension agent and the other had the botany professor. I was lucky to also have in my group a number of Tree Stewards. As the group wandered through the forested path a few of us lingered and assessed leaves, bark and other features to better ID plant material. I did take copious notes on the tour-- though not one photo. Imagine that! Oaks, beech, elms, hickory, and Ironwood were some of the trees along the way. 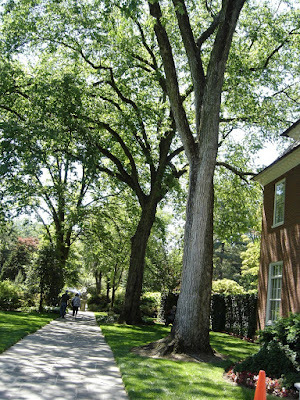 The tree whose leaf is used on the brochure is the Liriodendron tulipifera, Tulip Poplar. 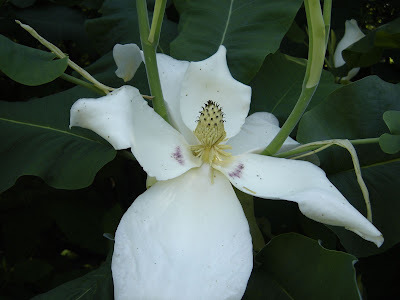 The Tulip Poplar was dropping spent blooms but the trees were so tall, we could not see the blooms on the trees. So some elementary ID tips-- oaks- white oak's leaves have rounded lobes and red oaks have pointed lobes and a black oak...well, um, they say you can tell a black oak by its acorn. As it not acorn time, that was hard to know for sure. The back oak had rounded lobes with bristle tips on the lobes..but online the black oak it said to have pointed lobes. We also saw a Blackjack Oak. Oh the varieties!! Here is a wonderful comparison page for oaks, from leaves to bark to fruit. Comparison of oak features. Ironwood, Carpinus caroliniana, also known as American Hornbeam is a nice tree. One of the best ID features of the ironwood is the shape of the trunk of the tree. The sides of the trunk are flattened...almost a soft square shape. Maples-- one person said that Red maples have pointed sinuses and sugar maples don't. Have I been able to verify that? No. It was a reliable source though. There were various hickory in the woods. I am still having a time with all of them. Let's just say my tree knowledge was increased and I have much more to learn!! The Adkins Arboretum was having a plant sale...I know!! Serendipity! 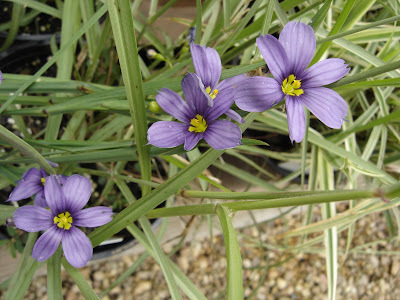 The lovely ladies who were riding with me bought me a sweet Blue Eyed Grass,Sisyrinchium angustifolium 'Lucerne' as a thank you for driving. What a thoughtful group! 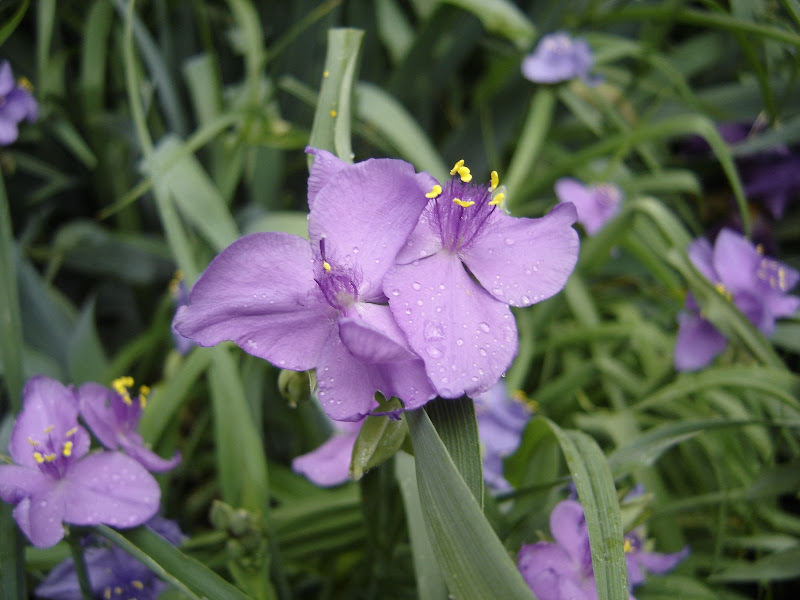 This is not my Blue Eyed Grass-- I went out to take a picture of it two days ago...the bunnies had eaten the blooms already!! On our way home we stopped at a nursery, Thomas Gardens. A well stocked nursery and greenhouse. As if there weren't enough plants in the cars and vans....more room was found!! 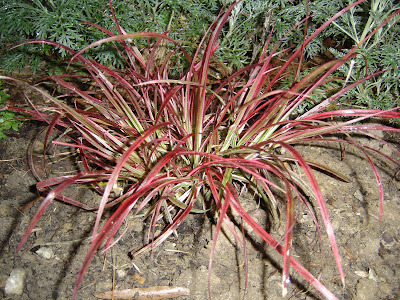 One plant that I bought was a Pennisetum 'Fireworks' --similar to the Rubrum in our area, an annual. I have never seen this variety before, so I figured it would be worth buying on the trip. 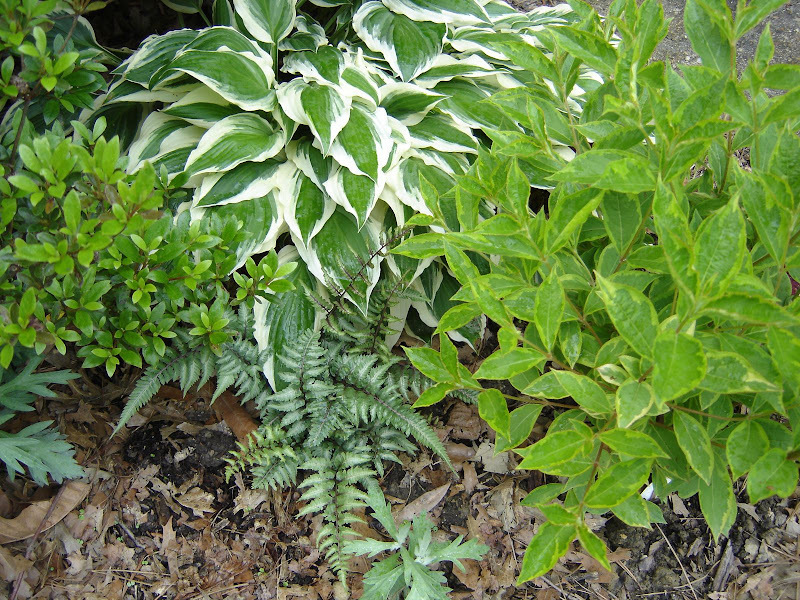 The foliage is variegated with white and pink and purple and green. Really interesting. The grass is supposed to get 30- 36" tall. Here ends our trip north and back. I hope everyone enjoyed hearing about the study trip. 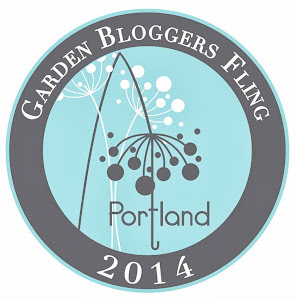 Please make sure to use the links and go to the various websites for each garden. If you can lend some information on more tree ID tips, PLEASE let me know. Beeches, birch, and elms still confuse me. This glorious garden bed, mirrored on the other side of the door, flanked the front door of Hillwood Estate. 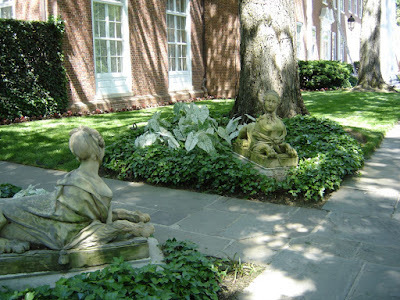 This grand place was the home of Marjorie Merriweather Post and since her death has been open to the public to enjoy. After going through the Visitor Center you are greeted with a grand motor court and the entrance to this magnificent home. It is amazing to think this palace (of sorts) is in DC. Mrs. Post lived and entertained in this home for almost twenty years. She has a fabulous collection of both French porcelain and Russian artifacts. The daughter of C.W. Post was married four times, her third husband was ambassador to Russian. While living in Russian she built her collection. Upon her death the home was turned into a museum. The house was designed to showcase her collections. Photos were not allowed within the house, so please click on the link to see the art collections. I was especially interested in the Fabergé eggs. Such magnificent work! The self guided house tour is available with headphones which makes it nice to go at your own pace. The gardens and lawns are beautifully designed. The rose garden was first on the garden tour.... loved the cooling shade of the arbor. Around the corner from the putting lawn it the main lawn, the Lunar Lawn. Grand entrances at every turn. The Lunar Lawn is framed with American Elm, Ulmus americana, I believe they said six. Two were killed by the Dutch Elm disease but there were others on the property that were moved to replace them to maintain the symmetry. From the porch, looking over the lawn the view is long -- though over the years the trees have obscured much of the view. If you open this photo and look really hard, in the center above the lion's shoulder blades you can see the top of the Washington Monument. 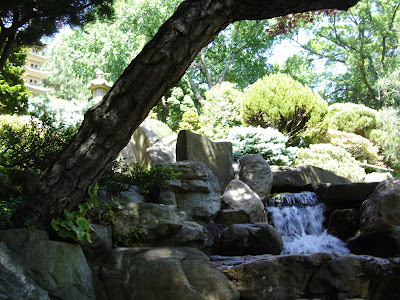 Below the lawn is the Japanese Garden, with tumbling waterfalls. 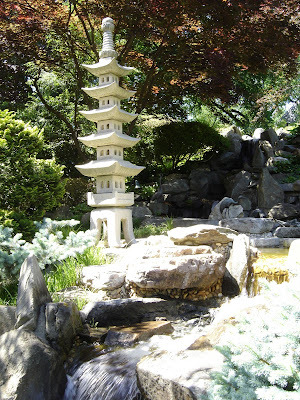 I think my favorite was the Japanese Garden. In the front of the house is a cutting garden, I want one of those!! Roses and peonies going strong! In the background is the greenhouse. 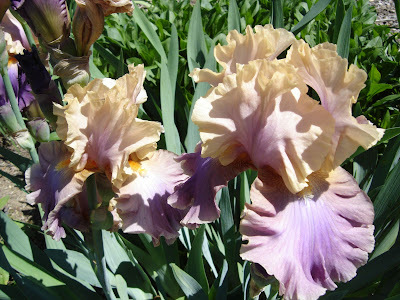 Don't you just love the color combo in this Iris? 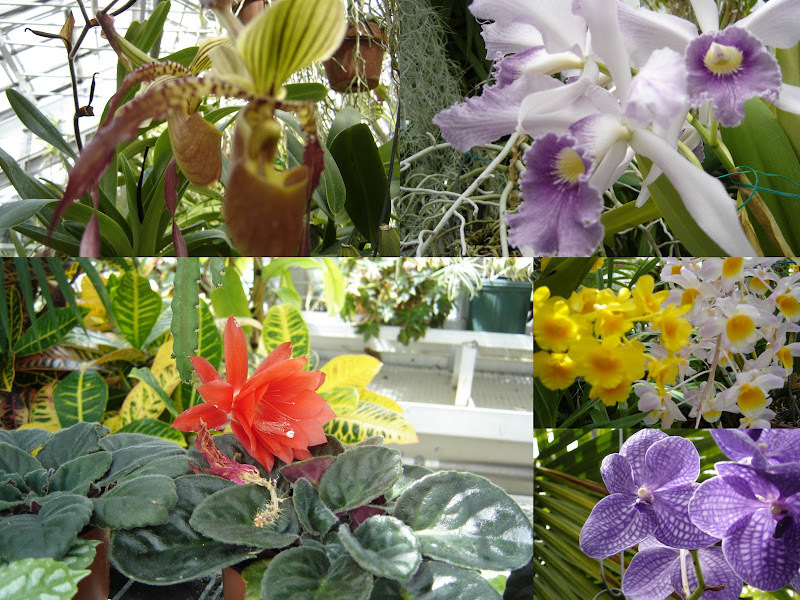 I will leave you with the collage of the greenhouse blooms. Check back for the third day's tour..... hard to believe we did so much in three days! * I already mentioned the bathrooms down the hall and around the corner, twin beds with plastic covered mattresses and very flat pillows, and coffee in the dining hall-- if we could get in there, needed a swipe card, oops. First, (after the coffee) we all piled into a Diner for breakfast. I had the heaping load of maple sugar in the form of French Toast made with Challah bread -and an egg for some much needed protein. Tasted great-- will not have a craving for French Toast for years to come! 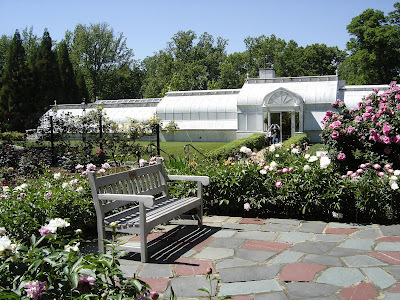 Our first stop for Wednesday is Brookside Gardens. After traveling through more DC traffic, we finally got there. Once again a wonderful garden. We were limited time-wise as the afternoon stop was one that required lots of time. 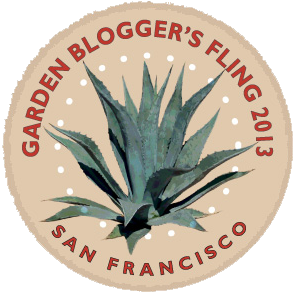 Be sure to check the link and then go to the virtual tour page...more information on the different gardens. On to Brookside. I apologize for some of the photos for this garden...it was a bright and sunny morning. The colors were a bit washed out but I do want to share some. There some formal beds with the structure of the walls and symmetry from one side to the other. 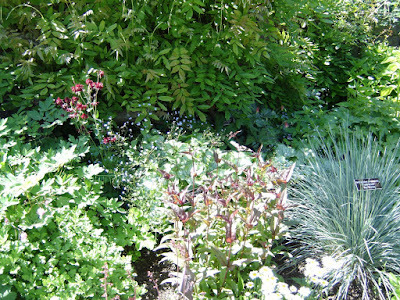 The color focus in this garden was burgundies and purples-- very nice. This garden is blues, purples and silvers. Here the dominate color was orange.. really popped in the bright sunlight. As time was limited, I opted to check out the roses next....they had a nice selection of many of the award winners from years past. As I had more time, I took the outer path back up to the Visitor Center. 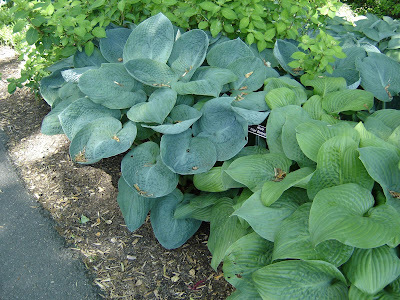 Along the way there were wonderful plantings of various sized and shaped hostas. I took this pathway to check out a maple with which I was unfamiliar. Snakebark Maple is the common name. Surprisingly I found two with said common name. One was Acer davidii and the other was Acer tegmentosum. 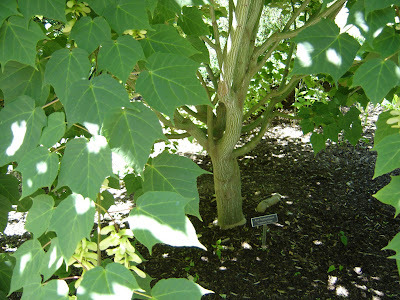 Pictured here is the Acer tegmentosum...an excellent reminder that common names are not a good indicator of what plant is what. In reviewing my notes I found an interesting Pieris japonica 'Bert Chandler' the new growth is white. 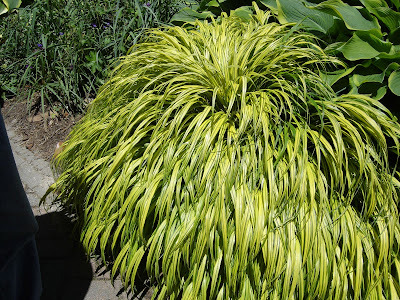 Also both at Meadowlark and Brookside there was an interesting tree with very fringy foliage, similar to a salt cedar. Taxodium ascendens 'Prairie Sentinel' or Pond Cypress. 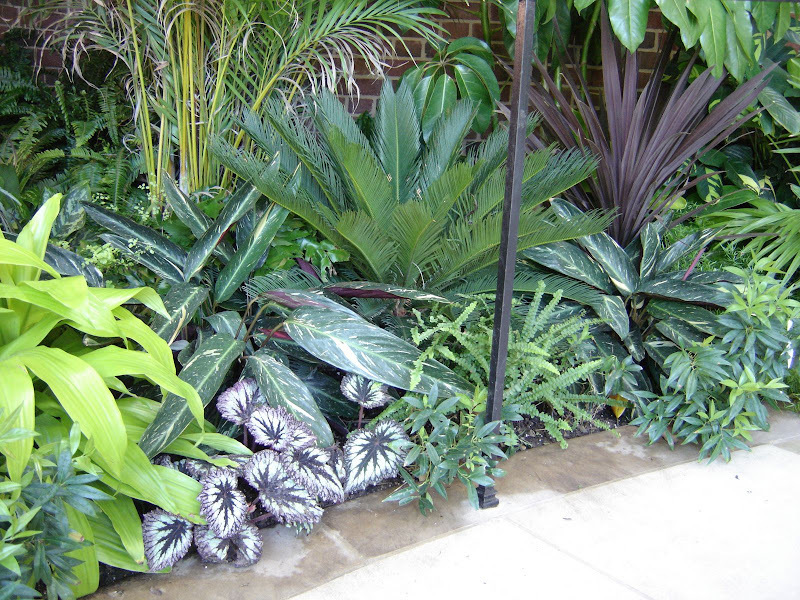 Check the link for a nice photo of the foliage. 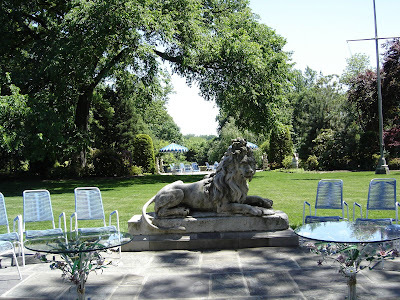 Tomorrow I will be sharing our visit to Hillwood, the home of Marjorie Merriweather Post. Stay tuned!! 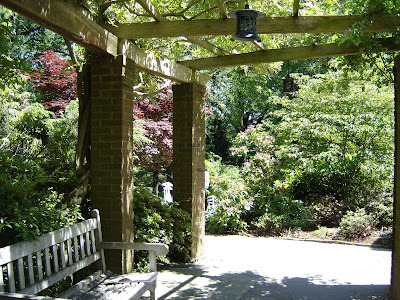 Our next stop on the study trip was to Meadowlark Gardens in Vienna, Virginia. It is hard to imagine these large quiet, green places in the middle of the hubbub of Northern Virginia. En route to Meadowlark we stopped at a large garden center, Merrifield Garden Center. What a place!! The plant purchasing began in a flurry. It is kind of funny to see how we all go ga-ga over plants in a nursery! Back on the road we got to Meadowlark a bit later than we wanted, but the cars had new plant material in the trunks! 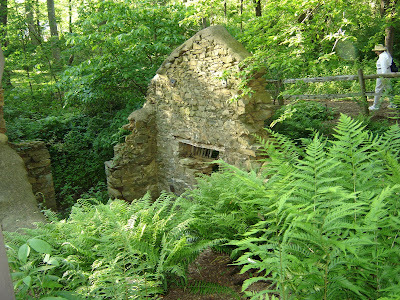 Meadowlark is a 95 acre garden, part of the Northern Virginia Regional Park Authority. At the front door there is a pair of wreaths on either side of the doorway. I am sure there are directions somewhere online as to how to do this. One of the people we were with went over 'how to' briefly. In a nutshell--wire wreath frame, spagnum moss sheets, potting soil, and plant material. Place the moss on the inside of the back of the frame, fill with potting soil, cover with more moss. Wire wrap the moss in place. 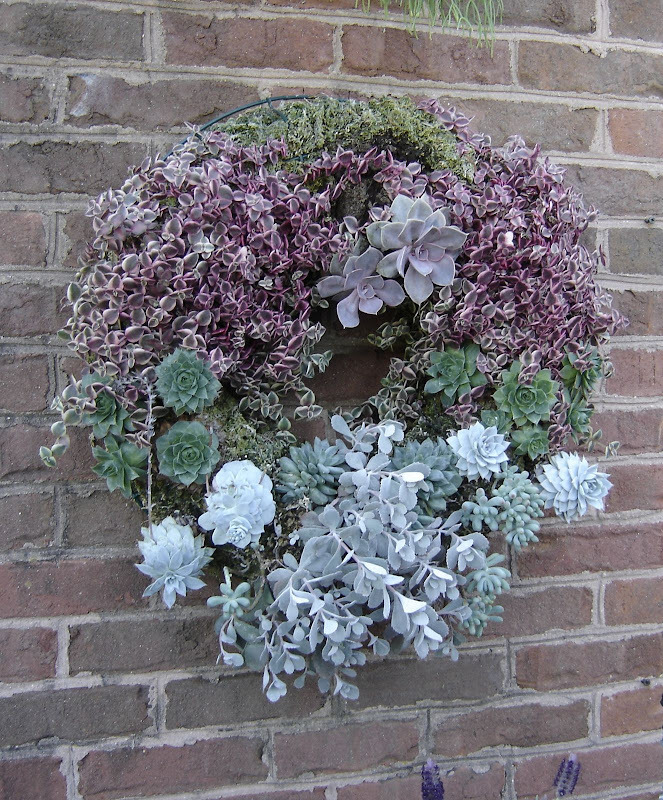 Slice some openings on the front of wreath and tuck plant material into holes. Wire closed if plant is heavy or hole is big. Soak in a diluted fertilizer mixture. Hang and admire. Soak regularly to keep plants hydrated. There are so many glorious areas of this garden. Meadowlark has a lot of native plant garden area. Deep glens of ferns and lush green growth. 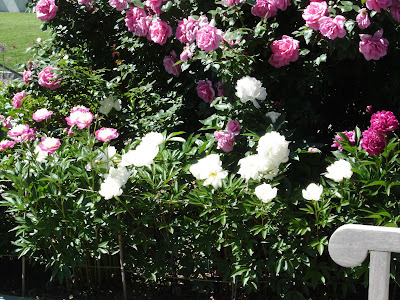 Open areas with wonderful blooms- again, roses and peonies! I find the Autumn Fern really nice in the landscape. 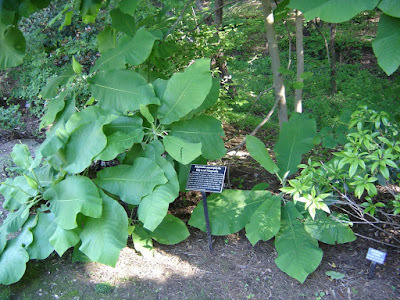 I had never seen a Large Leaf Magnolia before-- this was unbelievable. There were a few blooms open-- over 12 inches across and fragrant. There is a spring house at the lower end of the grounds and deep lush gardens with hostas and ferns. 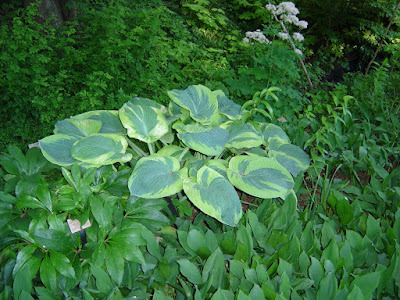 This was really interesting-- Ornamental Rhubarb with variegated leaves. 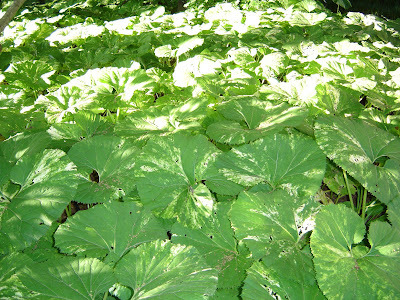 The leaves are about 16 inches across. 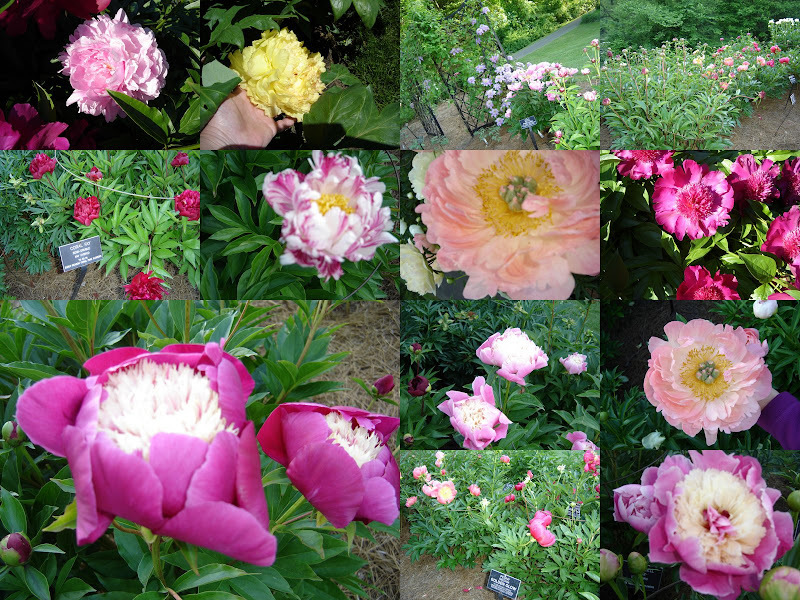 Around the back side of the grounds is a garden of all peonies! There was a lot of oohing and ahhhing. Some were more fragrant than others...but oh the variety! I feel as though I have been gone for a long time, but I look at the calendar and it has only been three days. 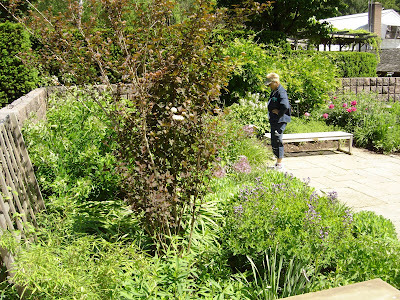 Each year the York County Master Gardeners take a study trip. 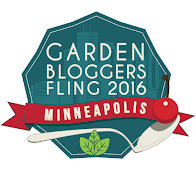 I have been a Master Gardener for almost 11 years and this is the first time I have been able to go on the trip. Last year they went to Ashville and hit multiple gardens in North Carolina. I had a couple college graduations that conflicted with the trip, so even though I was really interested in going, I just couldn't do it. This year it worked out and I was able to go. This year's trip was north to DC and then east to the DelMarVa peninsula and south over the Chesapeake Bay Bridge Tunnel to home. There was a multiple car caravan -- many outfitted with walkie-talkies. (that was too much fun--they shouldn't have given me one) DC traffic is wild and we were glad to have communication with the lead vehicle. About 31 Master Gardeners went on our trip as well as our Extension agent and a former Botany/ Biology professor who taught our botany portion of Master Gardener training-- imagine traveling to gardens with so many knowledgeable people! Our first stop (after lunch) was to Green Spring Gardens. This was a real treat for me as I went to high school across the 'street' from this garden. No, it was not there as a public garden when I went to TJHS. Hakonechloa macra 'Aureola' was a plant that we saw in multiple places within this garden as well as others on the trip. This is a striking grass for the shade. 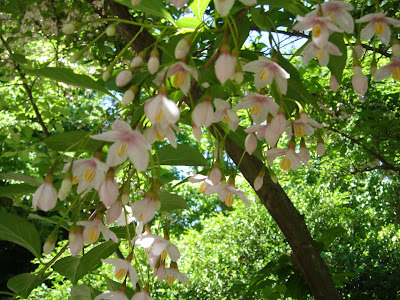 Another plant I saw a couple times on the trip was the Styrax japonica 'Pink Chimes'. Beautiful pink bells! For more info on this beauty check out this website. 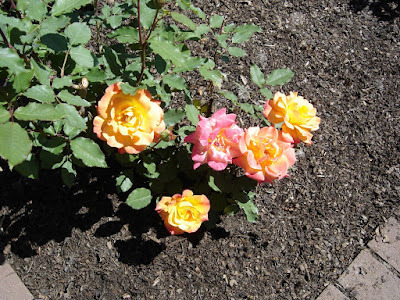 There was a grouping of roses and peonies that drew us over to check out all the heady fragrances. 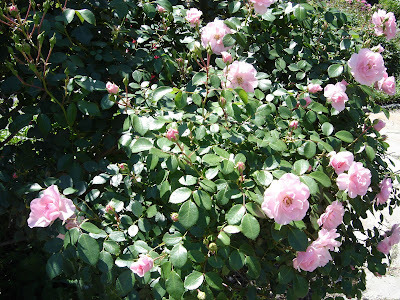 One of the roses was a Bonica Rose- pink, fragrant, long blooming, 'Modern Shrub Rose'....just beautiful! 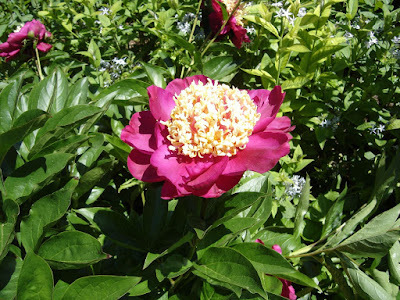 There were many peonies in this garden bed....one stole the show. 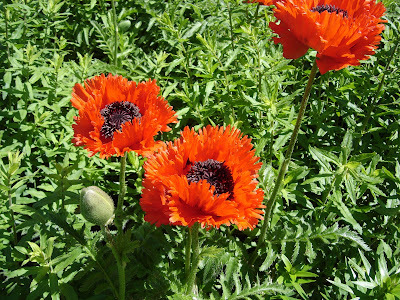 (At least for a time, we are fickle folks we gardeners...loving one flower after another) Unfortunately we could not find a name for this cultivar... I vote for 'Jewel Box'. 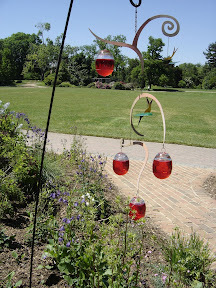 This garden included a children's garden, an orchard, a veggie garden, a swale garden (where I took this hummingbird feeder photo) and many many more garden areas. 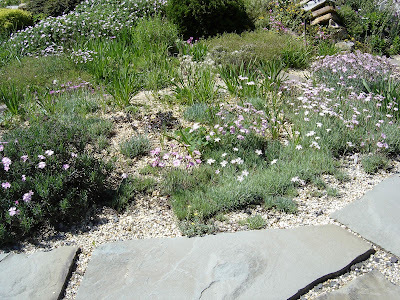 As we left the Rock Garden was our parting view.....the fragrance of all these Dianthus was wonderful! Each of the gardens we visited we could have stayed twice or three times longer...but there were more gardens on the horizion. Over the next few days I will give each garden a post unto itself. What to do on a Rainy Day? Blog About the Green! 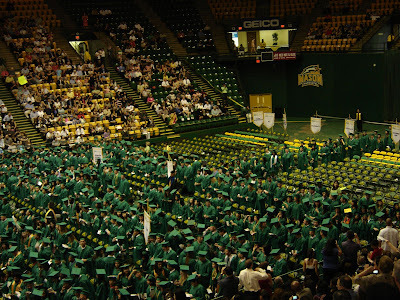 The weekend started early for us as we went up to George Mason in Fairfax, Virginia for another graduation. A very sweet young lady graduated on Friday afternoon. As it was a late afternoon graduation we met the family, including her brother who is home on leave from Iraq, for lunch at Olive Garden. Our youngest drove over from JMU where she was still packing up her apartment. The plan was to transfer some from her car to ours in the parking lot. Lunch was very nice. To convoy over to campus we got into our now loaded with apartment stuff car.....and it didn't start!! For some reason the battery was dead. We piled into our daughter's car and headed over to campus. Nice graduation, very proud of another grad. After graduation and a trip to Walmart to get a pair of jumper cables we were back on the road homeward bound. Hoping the tank of gas would get us there so we didn't have to turn off the car, we drove home(and I worried most of the way). Saturday morning was a new "Green" event. 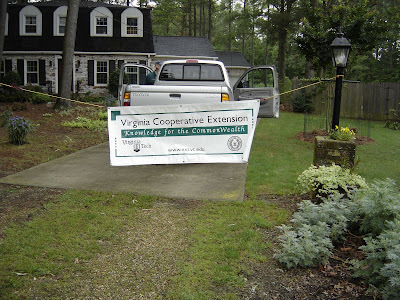 Our county extension office hosts lawn clinics in various yards over the growing season. 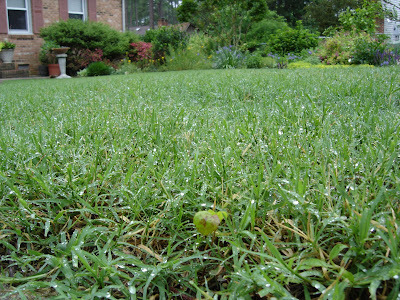 We have started to include warm season grasses...Bermuda, Centipede, Zoysia, and St. Augustine. Since my yard is Bermuda, our front yard was the focus of Saturday's lawn clinic. As I am also a Master Gardener on the lawn team, I helped with the presentation. see the weed, front row center? 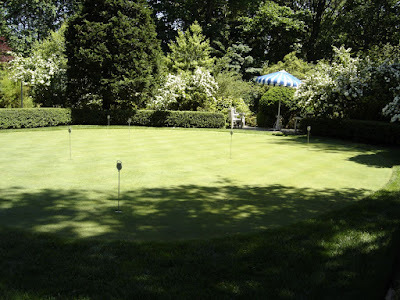 The lawn clinics have a great deal of information- from renovation of a yard to maintenance of an existing lawn. You can see the rainy day mode has already begun. 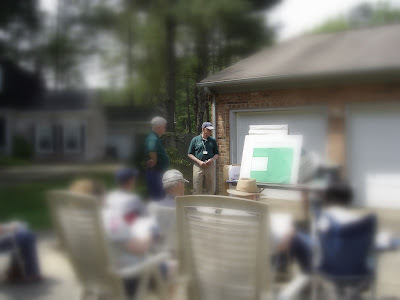 With materials in hand, our team leader presented a great deal of warm season lawn care information. Hard to believe it is already halfway into the month of May. 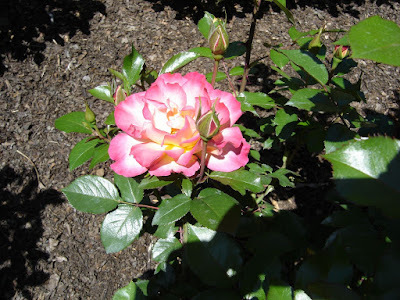 In the world of garden bloggers, we set aside the 15th of each month to profile what is blooming and share it through Carol at May Dreams Gardens--so head over there to see who else is posting their lovely blooms for the month of May. 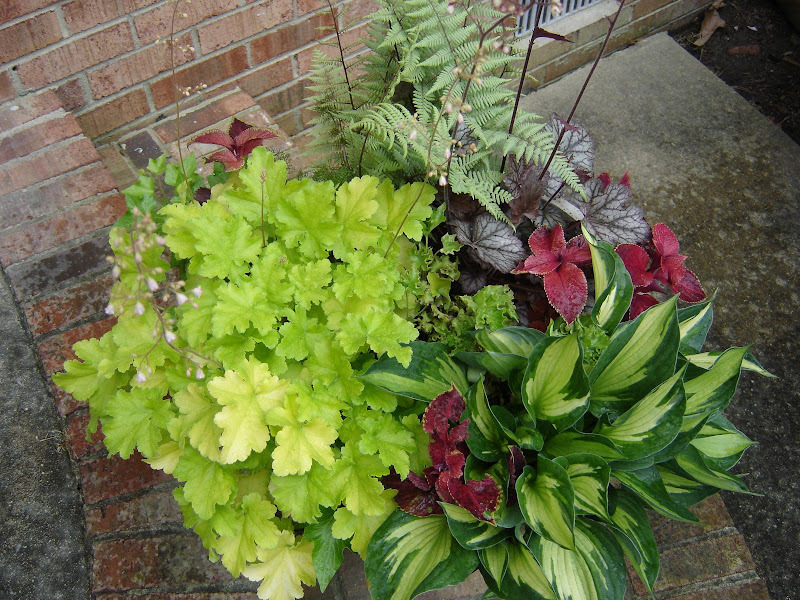 In the front garden, under the dining room windows, I have mostly azaleas, hosta, Heuchera, Artemesia 'Silver Queen'. I added a Weigela 'French Lace' that was on the bargain table in the fall. Seems to be happy there. 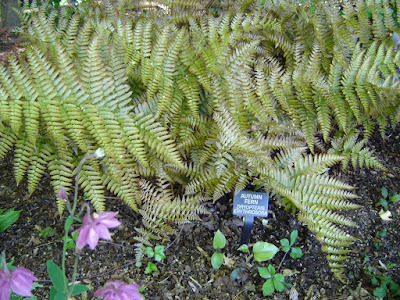 Nestled next to the Weigela is a new Japanese Painted Fern, Athyrium niponicum Pictum. So Happy Bloom Day to everyone........we are off to another college graduation. Lots of kids to be proud of this spring!! Not Gardening, But ohhhh the Chocolate! !